Kate, from Tumwater, WA, reviews the Radiation jackat, Axis pant and Zinc Fleece jacket. The Radiation jacket features 140 gm Permaloft body insulation, exterior zip-off hood with HydroMesh lining, waterproof powder skirt, interior hem drawcord, and dropped tail back hem. Color is aluminum/putty/mulby (very chic!). The Axis pant features 60gm of Permaloft insulation, elastic waistband at back, side leg pocket, AbradeGuard hem, water-resistant powder cuffs with gripper elastic, and PVC seat and knees. Color is aluminum putty (matches jacket). The Zinc fleece jacket is full zip and 100wt microfleece (very soft). Color is mulberry aluminum (total color coordinated combo). Kate, age 11, got right to business reviewing her Obermeyer outfit. A skier, Kate cruises black diamonds no problem. 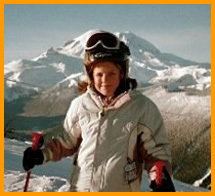 She got first tracks at Crystal Mountain in early December, testing the outfit in fresh snow conditions. Cool Factor: Outfit looks "way cool", "great colors", "very warm", "stayed dry and warm even when the wind was blowing and snow was coming down like crazy." Friends say, "Kate, that is hot." "Dad, can I get something like that?" Her friends were VERY jealous. Functionality: Though the jacket has lots of pockets, Kate would have liked some more (those kids! ), especially in the jacket. It was tough getting the walkie-talkie in without the antennae sticking up out of the zipper. The zipper pulls didn't last through the first weekend, but overall the jacket was warm and quite functional. The pants, with their snowboard styling (which Kate loved) were tough to get over the top of her ski boots. Even with their light color, they washed up great. 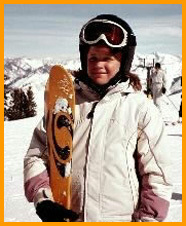 Kate hit the slopes of Sun Valley in February. Tore up the bowls: Easter Bowl, Mayday Bowl, and the bumps: International, French Dip and the upper Picabo Street. And with her Obermeyer outfit, she was "styling all the way". 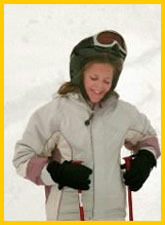 Order online at www.winterkids.com . A big selection of Obermeyer outerwear for toddlers, preschoolers and juniors. For a list of retailers near you see www.obermeyer.com.